Sealab: America's Forgotten Quest to Live and Work on the Ocean Floor is a fast paced and enjoyable read about our navy's nascent efforts to pioneer saturation diving as an alternative to traditional "bounce diving" methods. The story of the three relatively crude semi-mobile Sealab habitats (I-III) and their role in characterizing the macro-effects2 on saturation divers3 is simultaneously fascinating and of great historical interest. Hellwarth's Sealab perpetuates this promotional propaganda by referring to the then nascent navy "man in the sea" (aka Sealab) program as the underwater "Right-Stuff". More apropos is a comparison of the propensity to substitute costly and dangerous manned programs for less costly and dangerous unmanned programs. Unfortunately, after a half-century our researchers, writers and public are still awaiting disclosure of even the most banal primary source documents on Sealab4, including videos and documents of the disastrous Sealab III. Meantime, researchers, writers and the public must rely on important but less reliable oral histories and desultory press articles. 1. Today, NOAA's, National Undersea Research Program continues the basic and applied undersea research, including usage of autonomous and remotely operated vehicles (AUV-ROV). AUV-ROV augments today's semi-stationary and mobile saturation diver habitats. Eventually AUV-ROV can be expected to all but eliminate humans from the compression-decompression diving loop. 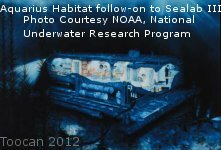 Hellwarth's Sealab, describes, in chapter 17 an early mobile application of Sealab's diver habitat concepts to the USS Halibut, SS(G)N 587 submarine platform. Of course current underwater or undersea diving habitats are configured for a variety of platforms and military or commercial purposes—all traceable to Sealab's prior proof of concept. 2. The1960s experimental divers participating on the Sealab teams were monitored for: respiratory; basic hematology and blood chemistry; basic urinalysis and urinary chemistry; saliva; electrocardiograph (ECG); blood pressure; body temperature; pulse; and gas uptake and elimination. Today's growing understanding of strong nuclear forces; electromagnetic properties of atoms and molecules; biochemistry; microbiology and nanomaterial has significantly extended the nascent Sealab cornerstone. 3. Currently saturation divers breath air with increased helium partial pressure and decreased nitrogen and oxygen partial pressures (HeOx). A HeOx gas mixture reduces the effects of nitrogen narcosis and oxygen poisoning. 4. Our classification system is so dysfunctional, irrational and impervious to all reforms that nothing short of en masse documentation release will correct the secrecy sickness and harm it has and continues to inflict on our nation. 5. Read Westinghouse Corporation's "Man-in-the-sea life support equipment" for an early (1960s) description of the undersea diving equipment and Northrop Corporation's "Deep Submergence Systems Terminology and Usage" for early (1970s) terminology.